BANGI, 7 Sept 2012 – The government is committed to providing higher education at a reasonable fee to the people and has in fact been providing subsidy of up to 95 percent in all the public universities in the country. 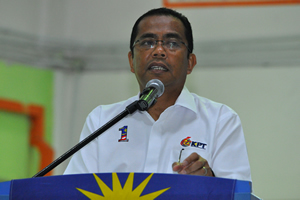 Minister of Higher Education, Dato’ Sri Mohamed Khaled Nordin said the government has also not increased fees for public universities for the last 10 years and has no intention of doing so in the near term. He was addressing new students of The National University of Malaysia (UKM) at the Keris Mas residential college here this morning in conjunction with their orientation week. Dato’ Sri Khaled also said that all students who are on PTPTN loans need not have to pay back their loans if they get excellent results for their first degrees. The government, he said, have no intention of burdening students but only want them to do their best when pursuing their higher education as it wants them to realise their true potentials and become assets to the country and not be a burden to the country or to themselves. The country with the best human capital will have the competitive edge and remain one step ahead of others in the future. It was thus imperative for them to strive for excellence for the future well being of the country which they will inherit and steer when the time comes, Dato’ Seri Khaled said. He reminded them that being in the university, they will taste much freedom as compared to the time when they were in schools. Nobody is going to come knocking on your door nagging you to study or to go to class as there are no strict rules dictating where or where not they can go to. That freedom is not given to enable them to do as they wish and break the law, but it is meant to train them to manage their life, time and priorities. If they can manage their life effectively, then one day they will able to manage the country. He also reminded them not to get distracted from their current role where their priority in the university is to gain knowledge and develop skills. Dato’ Seri Khaled also visited the Zaaba College and had another dialogue session with the students there. Present at the sessions with new students were the Vice Chancellor Professor Tan Sri Dato’ Wira Dr Sharifah Hapsah Syed Hasan Shahabudin, Deputy Vice Chancellors and Director-General of the Higher Education Department, Prof Dato’ Dr Rujhan Mustafa.